It took me a considerable amount of time to get into New Order. Yes, I know they rose from the ashes of much loved Manchester cult rock group Joy Division (whom I never got into) and their "Blue Monday" single was supposed to be a ground breaker. Still, nothing really clicked until my brother got this double album of remixes, greatest hits, re-recordings and the new single "True Faith." That song broke crossed over into the mainstream and was featured on the soundtrack of the Michael J. Fox "Bright Lights Big City" movie, so by this time, I was surrounded, really. I was smitten with three songs from this album -- "True Faith," "Bizarre Love Triangle" and "Perfect Kiss." 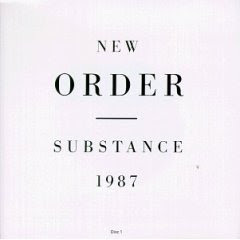 As a latecomer, the only New Order albums I ever bought were the last two -- "Get Ready" and "Waiting For The Sirens' Call" -- and then about two years ago, I dug back and bought "Technique." 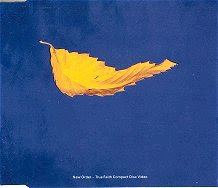 In the age of CD singles and downloads, compiling New Order's singles works just fine for me. I've listened to them enough to appreciate and admire the dance music they pioneered, and why they sound so different than other bands. New Order struck me as a rock band who preferred to work with popular 4/4 kick drum on the beat and hi hat playing 16ths dance rhythms of disco, rave and electronica. Even war horse Quincy Jones signed them to his label in the US, so he was hip to their sound and popularity. * The song title is never in the lyrics. As catchy as the whole "True Faith" melody is, the lyrics are rather introspective and depressing. On one hand, they appear to be about escaping a dark childhood (My morning sun is the drug that brings me near/To the childhood I lost, replaced by fear/I used to think that they day would never come/That my life would depend on the morning sun), while I've heard another interpretation of it being about breaking free of heroin addiction. Either way, a great example of heavy sad lyrics with a bouncy tune and you can dance to it! * Peter Hook's bass. Like John Entwhistle, you can not mistake Hook's live electric bass in the songs. First of all, hats off to these guys putting a live bass in a musical genre that always featured synths doing the job. Hook's bass has this hollow, scratchy tone in a dark reverb, very much played as a strong melodic instrument rather than just "holding the bottom." * Bernard Sumner's acoustic guitar playing. Another instrument usually not associated with the dance music genre, yet he strums it hard and feverishly and it works. A-ha employed it in their "The Living Daylights" single discussed earlier. Done the right way, the chords ring out over the synths beautifully. Below are three "True Faith" videos: first is the original one from the single, done by French director Philippe Decoufle and winning all kinds of praise when it came out -- it certainly has a subtle surreal flair with its opening face slaps done to the beat. The second is the band performing the song live at 1998's Reading Festival. As you can see, there was a lot of simplicity in what New Order did -- basic synth pad chords, straightforward acoustic rhythm guitar, live drums -- no show-off virtuosos really needed to make audiences dance. And the final is a very fine well-edited video of the outstanding Shep Pettibone 12" remix.